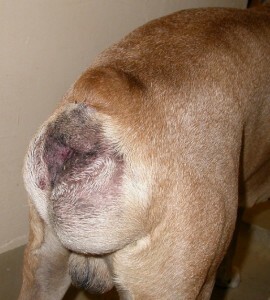 Over 90% of uncomplicated cases receiving rupture repair and castration resolve following the surgery. In experienced hands, complications following surgery are infrequent, and animals usually stay in the hospital for a few days to ensure they are comfortable and passing faeces easily. Pet of the Month for September is a delightful Golden Retriever called Mawgan, seen here recovering from surgery in the lap of one of our nurses. 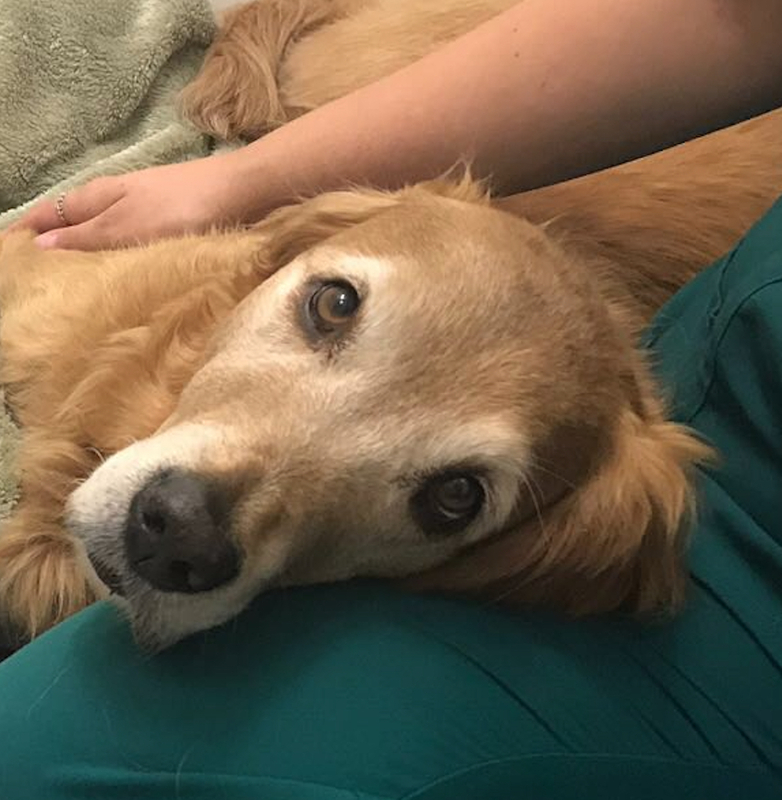 He came in to the clinic for our August Offer which was designated Check-a-Lump Month and subsequently underwent surgery to remove 2 lumps from his feet. We are pleased to report that Mawgan is recovering very well! 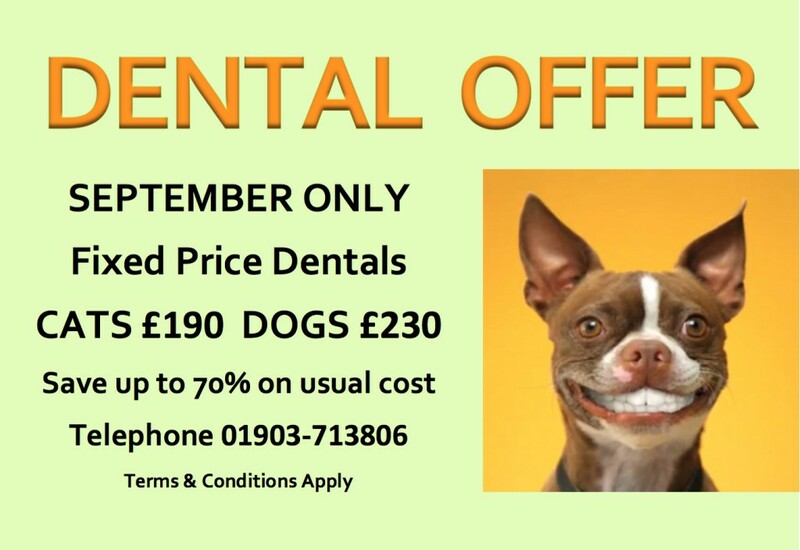 Pet of the month for August is Max, seen here with a soft buster collar to prevent him scratching himself. Max is recovering from a severe anaemia caused by a flea infestation. 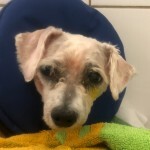 The severity was in fact so great that Max had to have an emergency blood transfusion, and his coat was completely shaved off. Fleas are a blood sucking parasite and in sufficient numbers can deplete the number of red blood cells circulating in the body. The very prolonged warm spell we are having is causing flea numbers to rise exponentially. Each flea can lay up to 50 eggs daily and these can hatch within 14 days in hot weather. Although it is extremely unusual for a pet to be parasitised by fleas to this extent it is a warning to us all to maintain flea and all anti-parasite control this summer. The parasitic mite Demodex can infect the haired skin of the feet and result in pododermatitis. 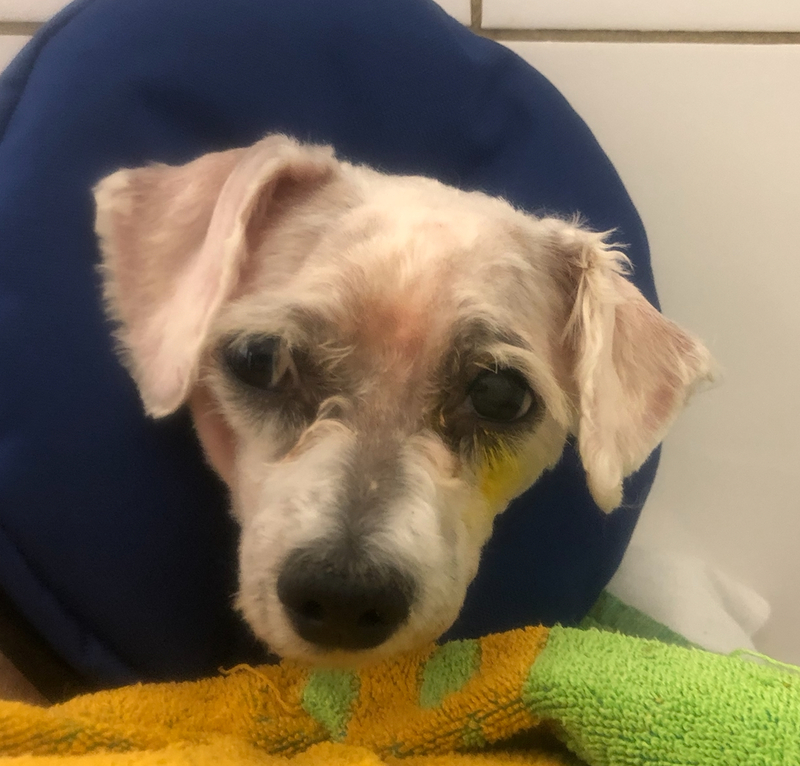 Demodex mites are present in very low numbers in the skin of all dogs, but in some patients, either due to a genetic susceptibility, or due to a process that lowers the immune system, these mites can populate the skin in very large numbers causing disease. Pododermatitis due to these mites tends to result in hair loss, swelling and bleeding sores in some cases. This mite is not infectious to other animals or people, but requires specific treatment to reduce mite numbers down to normal levels again. Very rarely, other parasites can also contribute to pododermatitis. Allergic diseases in dogs and cats are very common, and results in inflammation in the skin. This inflammation is very commonly seen affecting the feet, and results in redness, excessive licking and chewing at the affected sites. The most common triggers for allergic pododermatitis are food items and environmental substances such as dust mites and pollens, and skin disease usually starts in early life between the ages of 6 months and 3 years. 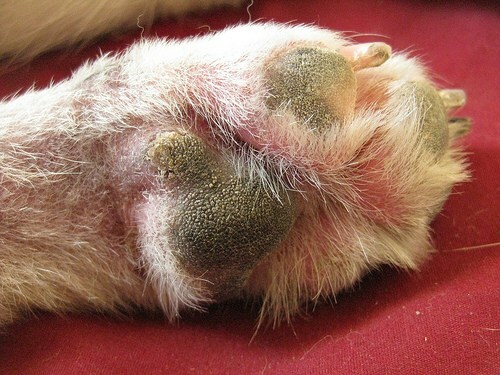 A very common feature of pododermatitis, particularly in dogs, is a deep infection of the feet. This is usually due to bacteria, but can be due to rare fungal organisms, and often results in multiple painful, swollen and discharging lumps. Affected animals usually lick and chew excessively and can become lame in severe cases. Bleeding lesions are relatively common with deep infections. A frustrating cause of pododermatitis is termed conformational pododermatitis. This usually occurs in heavy set dogs with excessively splayed feet. This results in weight bearing on hairy parts of the foot adjacent to the footpads and triggers inflammation of the hair follicles. Over time, this inflammation damages the hair follicles and results in chronic inflammation with the feet. 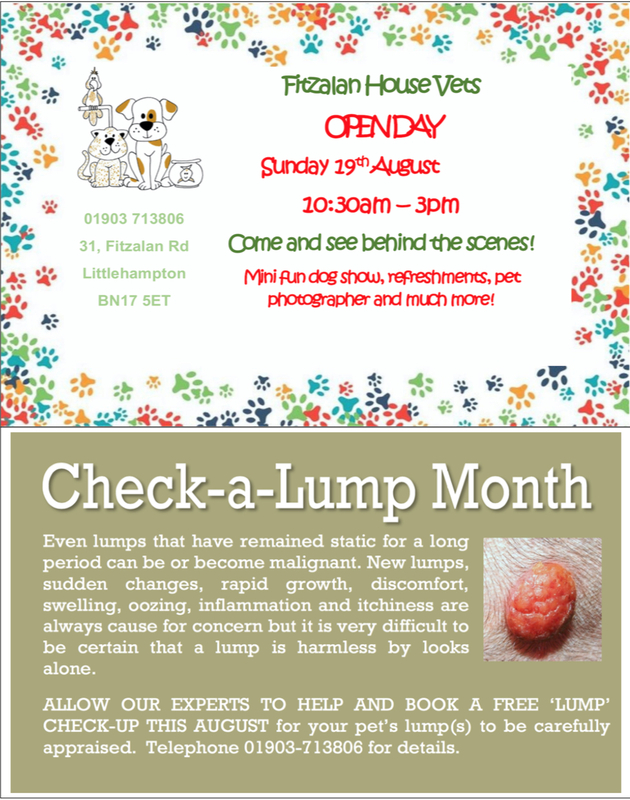 Dogs with this condition tend to have large areas of pad extension, with painful and swollen lumps around the toes.